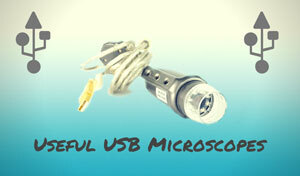 The Celestron 44330 handheld digital microscope can't be beat when it comes to a quality yet cheap model. This lightweight digital and optical unit brings the microscopic world alive for the beginning explorer, while still offering power and great images. A nice thing about this microscope is that it allows you to take and manipulate still pictures and video footage. The camera feature works without the included software, so you can plug-in and get exploring. Users can explore anything from coins all the way to bacteria. All for around $150. The Celestron 44330 has been discontinued. 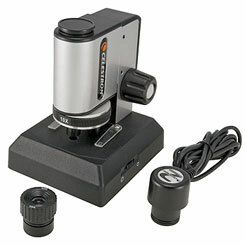 New Celestron microscope models can be purchased from Ebay. This microscope has a lot going for it. For starters, it weighs only nineteen ounces even though it has a metal body. This makes it possible to take it just about anywhere. Finding a power source for it isn’t a problem either, since it only needs two AAA batteries. This unit comes with three objective lenses. You can use the 5x, 10x, or 20x to get up close and personal with your specimen. The 20x eyepiece really helps to enlarge the optical potential of the microscope. The digital capabilities of the Celestron 44330 are probably its best selling feature, as it's usable as a still or video camera. It has a 2 MP microscope camera, which gives you a pretty crisp image. The digital power itself maxes out at around 2000x. Not too shabby! The included Arcsoft photo software lets the user manipulate the specimen images to their heart’s content. You can change the resolution, contrast, color, and even enlarge the image to the max of the computer screen. The software also lets you edit video, so users can create a memorable clip. Overall this is a great microscope with very few issues. Some state that the optics are not the best. Yet considering the price, usually around $150, this isn't too surprising. The microscope makes up for this when linked with a computer, as the images on the screen are crisp and colorful. It's worth noting that you need to load the software if you want to use all the features of this microscope. The video feature needs the software to run. You also need to have it loaded if you want to manipulate the images. Another reported issue is the limitations of the lighting source. The bottom LED illuminator works fine, but does not provide any front light. One may have to find an additional light source such as a penlight to correct this. The Celestron 44330 is a great piece of equipment for the budding scientist. The digital capabilities allow the user to capture images of specimens and play with them on the computer screen. It's reasonably priced, but with the same great quality and features that come with the Celestron name. Recommended for: The advanced user may not appreciate this microscope. However amateurs or novices will enjoy how well it brings specimens to life. Good for teens, adults, and even younger kids.